Umm..it's coming along quite nicely but something doesn't feel quite right. You see, I spend every, and I mean every, possible spare, and some not-so-spare moments, with my crochet hook in my hand - and look how s l o w l y it has grown! I must admit that all the ends have been sewn in (hooray!) so far but it still doesn't look big enough to justify the numerous car, bed, lonely railway waiting rooms, school lunch hours, Ludlow,trains, Tom's drum lessons, Salisbury, restaurants, children's singing shows, and blissful moments by the fire with the TV, sessions! I do have a few more squares to sew on but still...even the photo makes it look bigger! But I am not discouraged and already have my next project lined up in my head. I get a strange kind of pleasure thinking about what's next on my list. 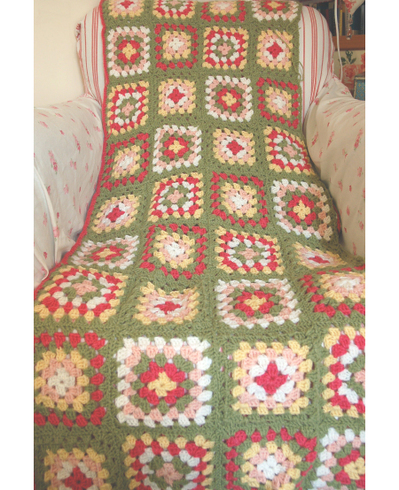 I do have a confession though - I haven't blocked any of them and after reading about what a difference it makes I have decided that I will do the whole lot now before I add anymore squares. I'm just too impatient but hope to be convinced that it will be worth it. Any hints or tips gratefully received!